An affogato is a traditional Italian espresso-based dessert. The full name is really â€œaffogato al cafeâ€ or â€œdrowned in coffee,â€ in Italian. The name really suits the dessert, as it consists of a scoop of ice cream/gelato with a shot of hot espresso poured over the top. I like the classics, so vanilla ice cream or gelato with strong espresso is always my default affogato, but it’s an easy dessert to dress up just by using a different flavor of ice cream. 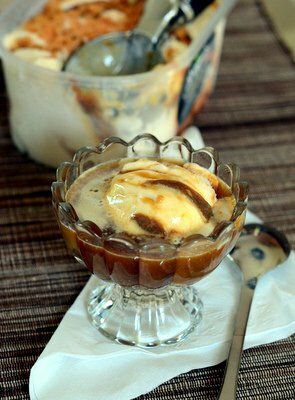 This Vanilla Caramel Affogato combines both vanilla and caramel with espresso – and it’s a great combination because the espresso cuts the sweetness of the caramel while the caramel brings out some of the burnt caramel sweetness of the espresso. I used Breyer’s Vanilla and Caramel Gelato, which is a vanilla ice cream that is swirled with a generous amount of caramel sauce. It’s sweet, creamy and was a perfect fit for this dessert. Any caramel-swirled ice cream will work equally well, and you can make your own by simply adding some caramel sauce to your favorite brand of vanilla ice cream. Place a scoop of ice cream into a small bowl, top with espresso and your affogato is ready to eat. Affogatos are easy to make one at a time, so they’re great when you want to treat yourself and don’t want to make a mess in the kitchen. 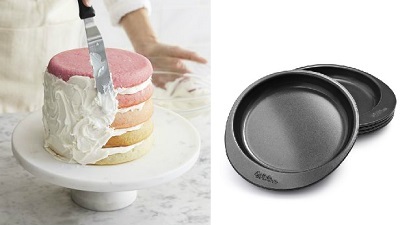 You can also easily make them for a crowd by portioning out your ice cream scoops onto a baking sheet and freezing them in advance, then brewing a strong pot of coffee and just plating them all up in small cups when you’re ready to serve. Place scoop of ice cream into a small dessert cup or bowl. 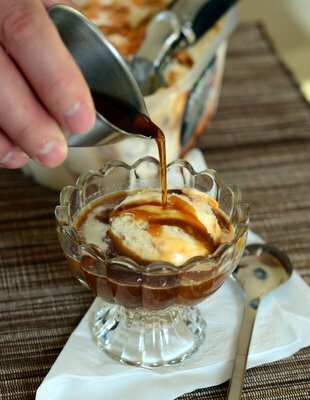 Pour caramel sauce over the top of the ice cream, if using separate caramel sauce. Pour hot espresso shot over the top and serve immediately. I love, love, love affogatos, they’re so ridiculously simple but are just one of the most perfect desserts/treats/pick me ups for any coffee lover. This is great! 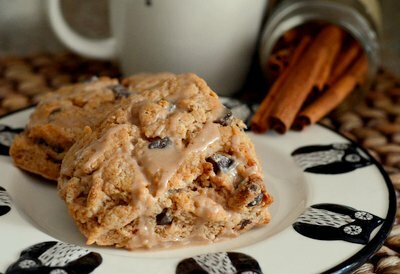 I’m not much of a baker, but I do love a good quick and easy dessert. I will give this a try. Thanks for posting!